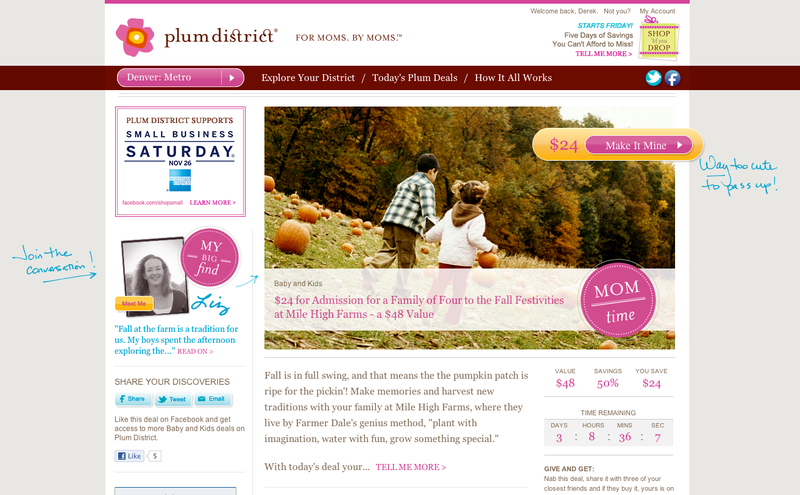 Plum District was a daily deals business “by moms, for moms”. Local mothers formed the nation-wide sales force to generate side income while staying home with their children. 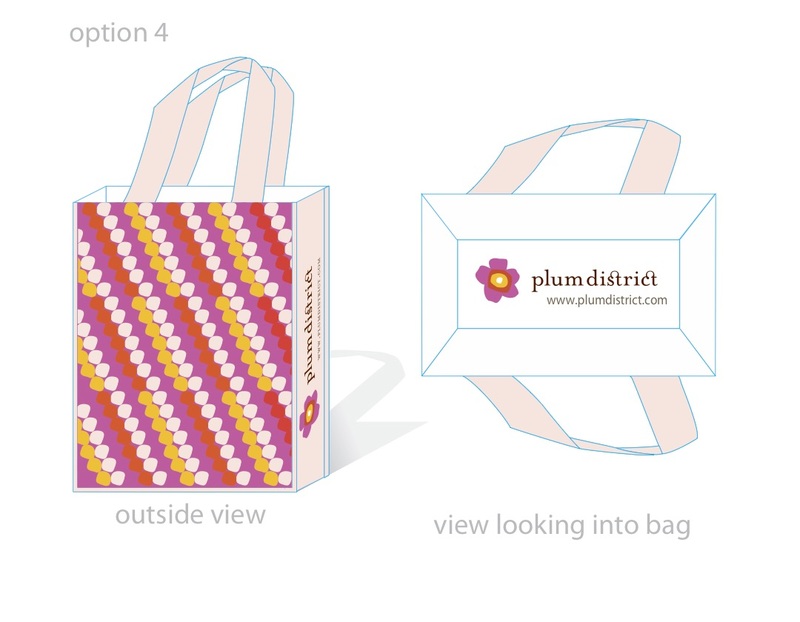 As the company’s sole designer after their Series A, I developed much of the visual identity of Plum District’s new brand and was responsible for introducing several new ecommerce features. The breadth of Plum District’s touchpoints with it’s 3 audiences made it sometimes hard to understand how all the pieces were related. I created several maps and drawings of various parts of the product to help consolidate the team’s collective understanding. 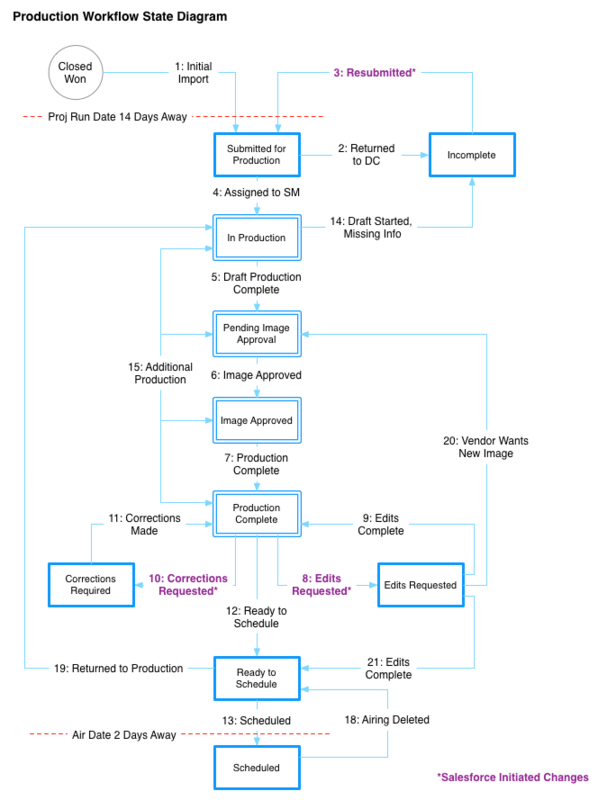 I created this Global Site Map for the public website to help product and engineering understand everything we had built. 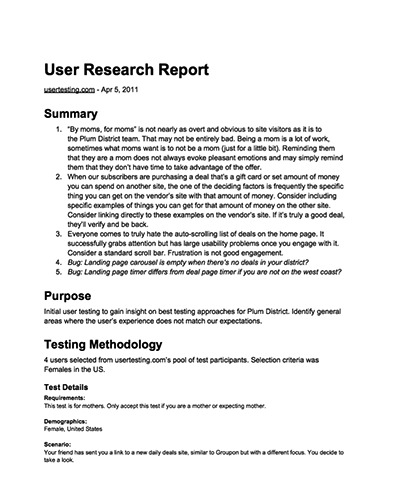 I wrote this report summarizing our initial user research using UserTesting.com. and it’s a good example of the insights I gather and one way I can communicate them. I created this incoming traffic map to help the team better understand how various marketing channels directed traffic to different parts of the site. 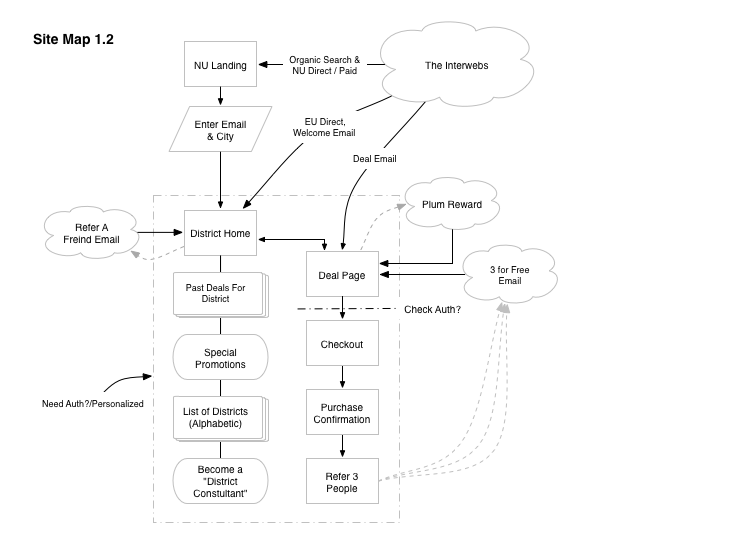 This diagram accompanied a training manual for the Sales team describing each possible state for a deal as it travelled through the Salesforce sales pipeline. It also defined how the production team that was responsible for producing the deal copy and imagery would coordinate with the Salesperson responsible for the deal. 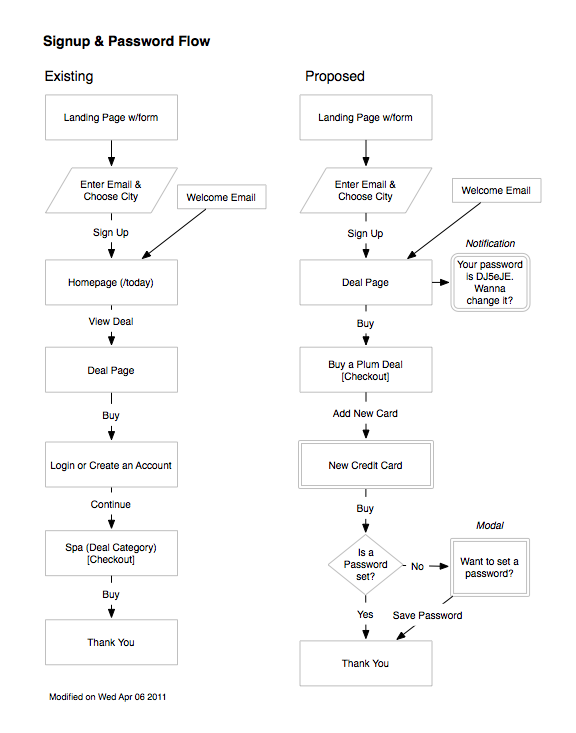 This diagram compares incorporating the creation of a new account and password flow for initial Deal purchases. 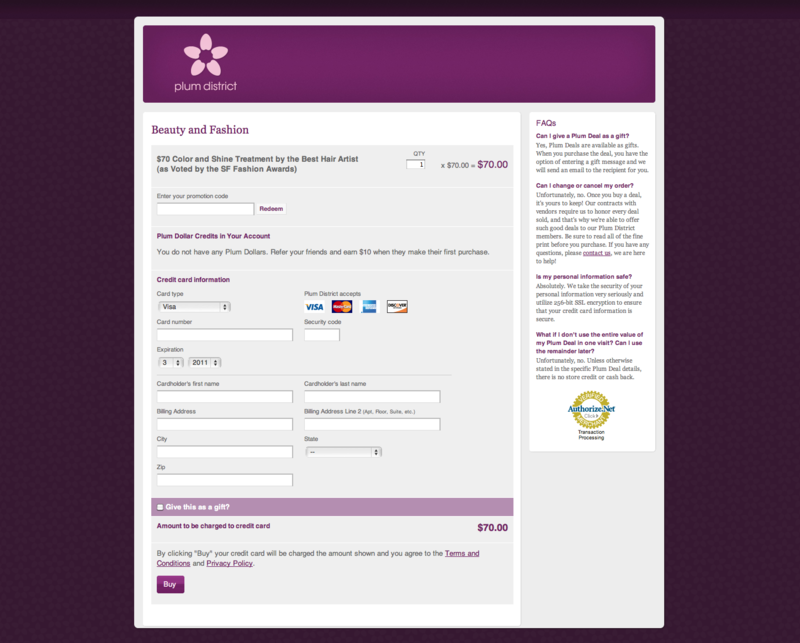 One of the first things I worked on after coming on board was a quick but sorely needed update to the checkout interface. It’s a good example of my approach to simplifying an interface within existing design constraints. 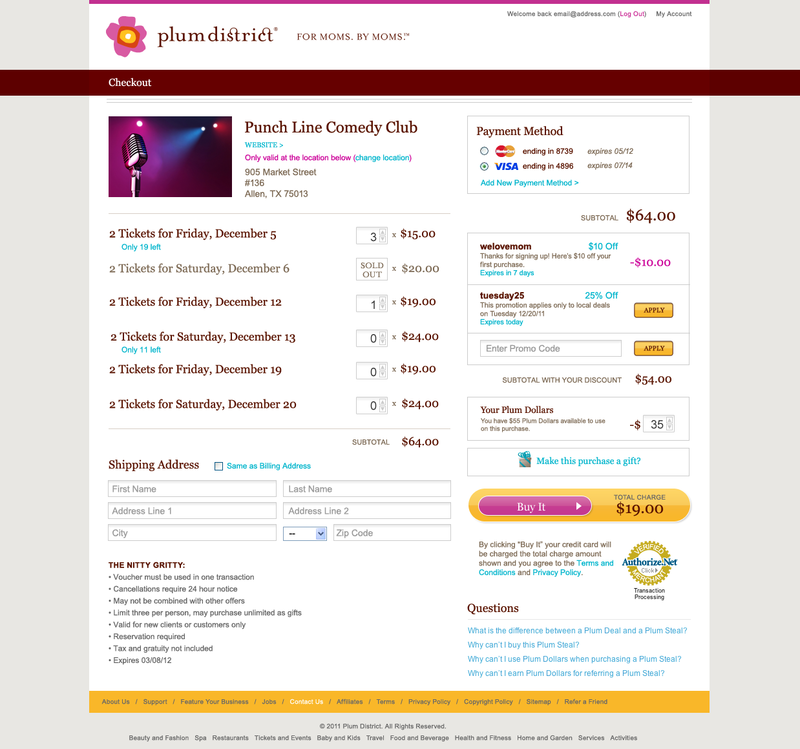 For comparison, this is what checkout page looked like before I worked on it. 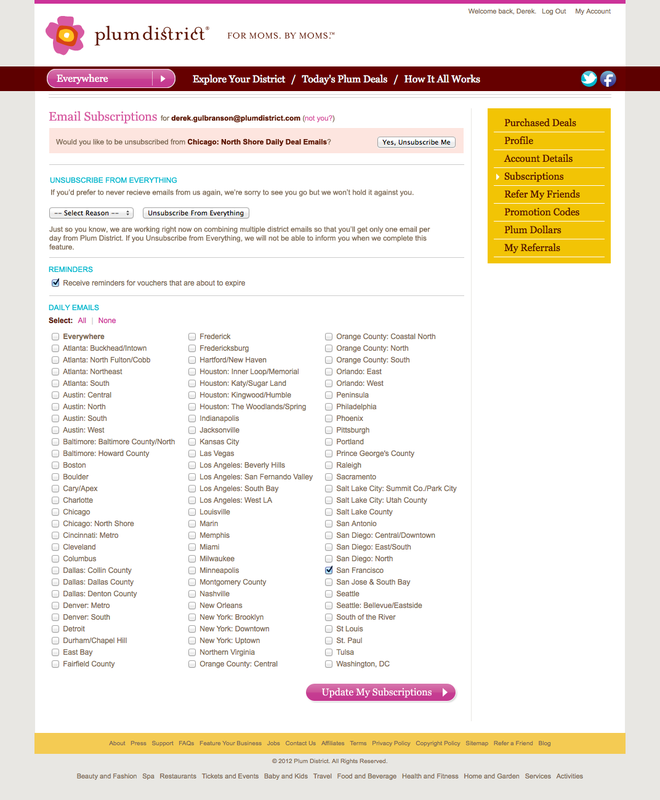 To remove visual clutter and decrease the cognitive effort required to understand the form, I removed most of the form fields that were not needed unless you were adding a new credit card and streamlined the information hierarchy. 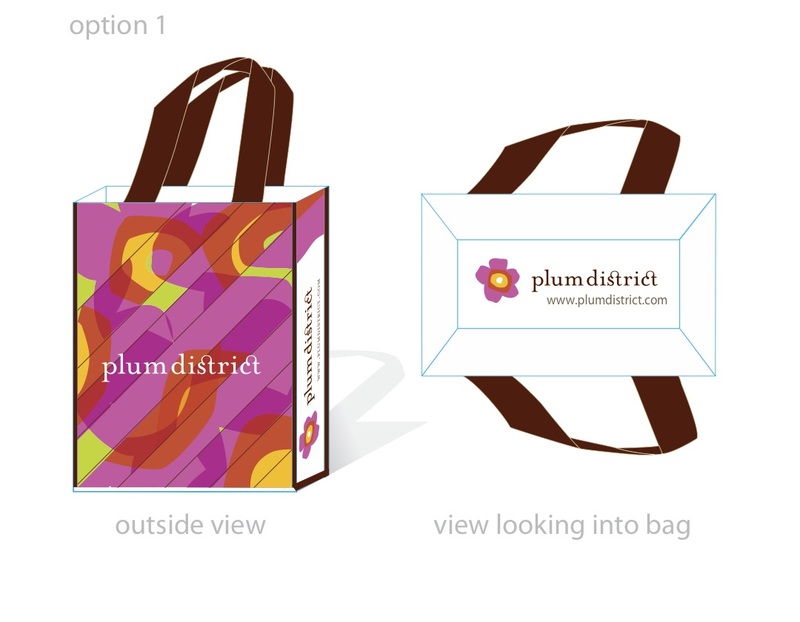 Plum District undertook a major rebranding project led by an outside branding agency shortly after I joined. It was a great experience to be part of the entire brand generation and exploration process for a brand with big goals, a niche audience, and VC backing. I can’t take credit for the visual design of the brand, but shortly after this project was completed, we needed to redesign the purchase flow to allow sales to present offers for more than one product from the same vendor. I worked with Sales and Engineering to identify what features were required, how the feature would integrate with the Salesforce backend and the constraints that imposed, as well as resolving the visual design changes required in order to support the new options. 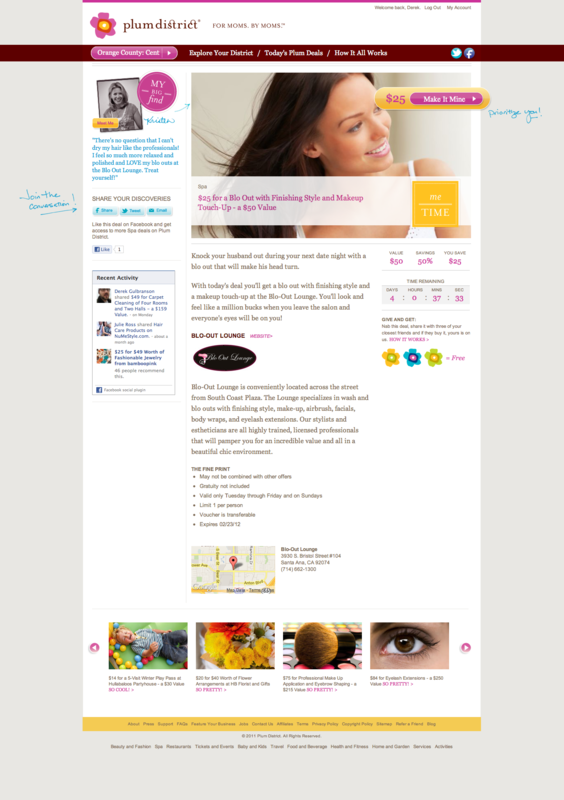 For reference, this is what the Deal Page looked like before incorporating multiple line items. 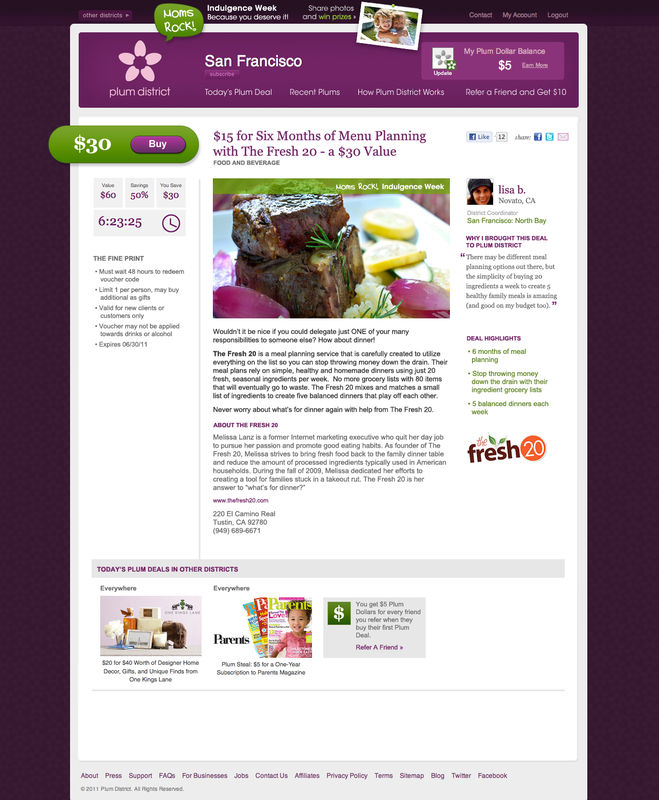 The deal page incorporating multiple line items. The new design also included automatic calculation of discounted price when the user had credit available in their account to provide further purchase incentive, as well as the ability to support multiple redemption locations for a Deal. 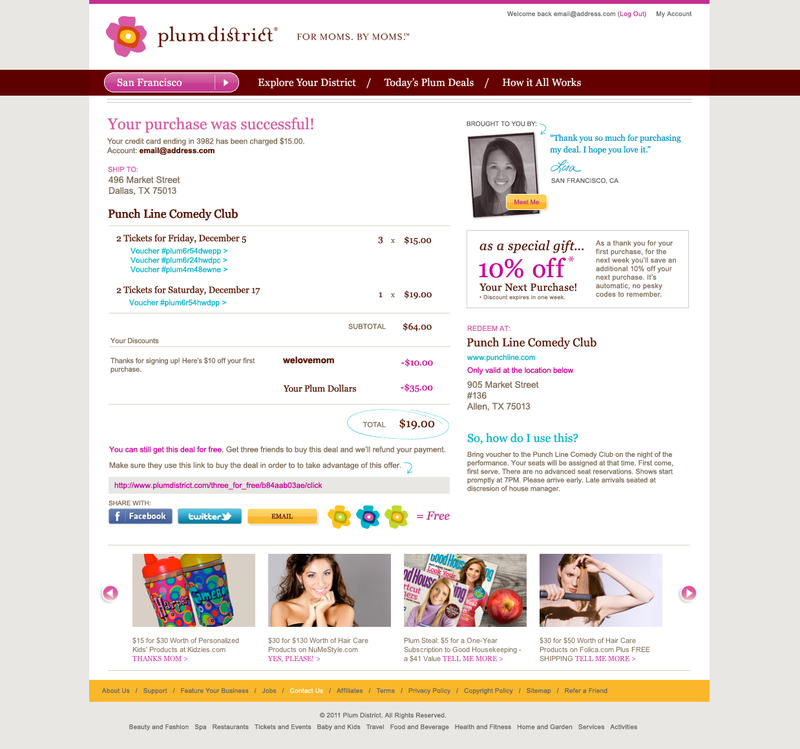 The checkout page design allowed for any number of items from a vendor. The sales person could define quantity limitations and defaults. The purchase confirmation page included a photo and note from the mom responsible for organizing the deal with the vendor. Again trying to reinforce the personal connection to the local mom that set up the deal with the vendor. Mom’s use their smart phones a lot. 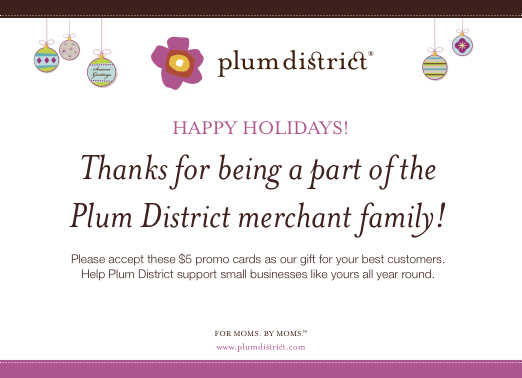 Plum District wanted to make it easy for moms to purchase deals on the same mobile device where they got the email. 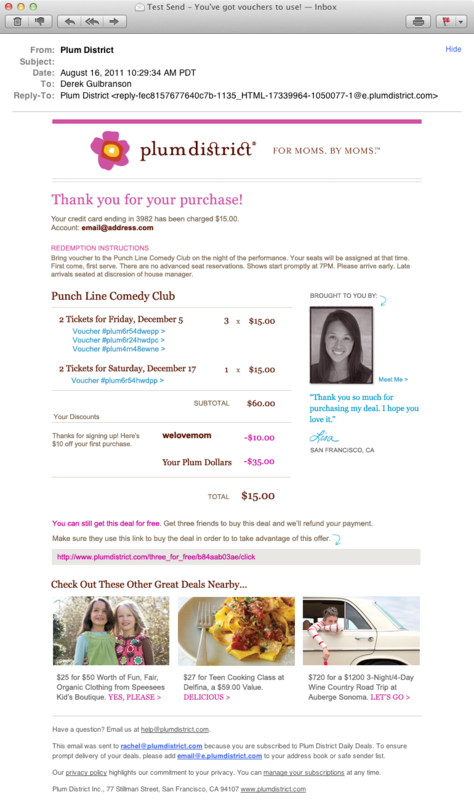 Under a tight time frame, I designed a mobile version of the deal and checkout pages. 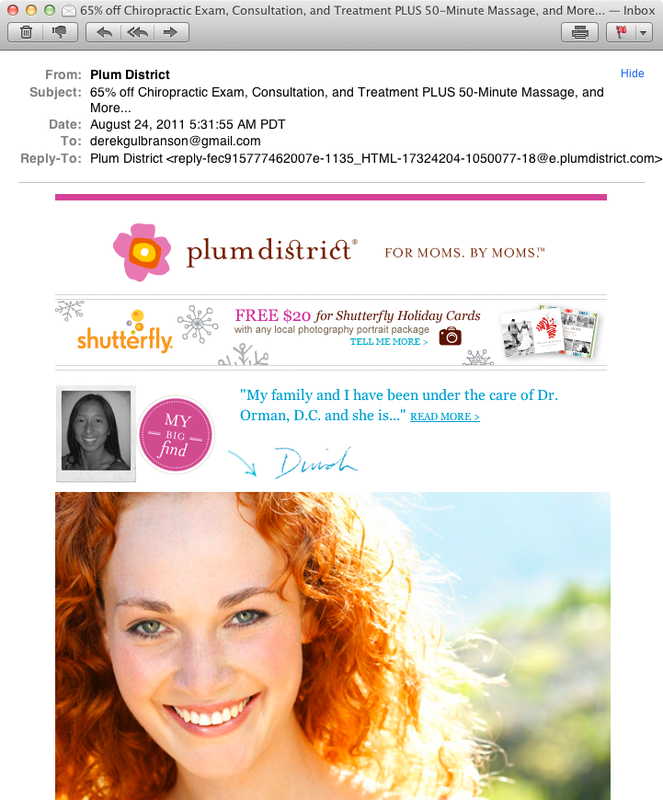 I designed Plum District’s email unsubscribe process using the same user experience considerations that I learned from my time consulting with large, international law firms on their email publication processes. I worked closely with the in-house marketing team to design and produce assets to support promotions on the marketing calendar. 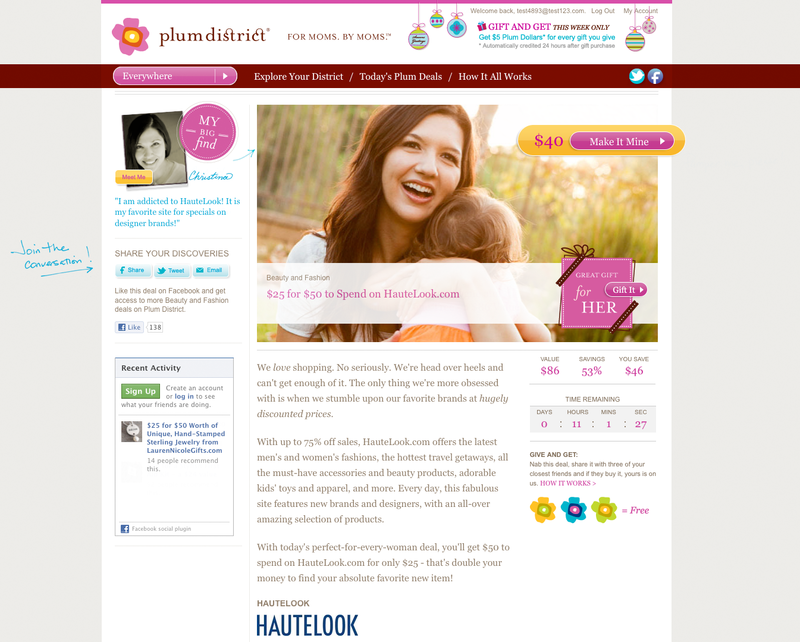 Promotions frequently featured a unique badge that was added to the normal deal page design, as well as a promotional header for the web site and daily deal email. Because of the frequency of marketing promotions, I also worked with Product and Engineering to implement a mini publishing system for these promotions that allowed them to be scheduled and run without needing to coordinate the timing with engineering deployments. 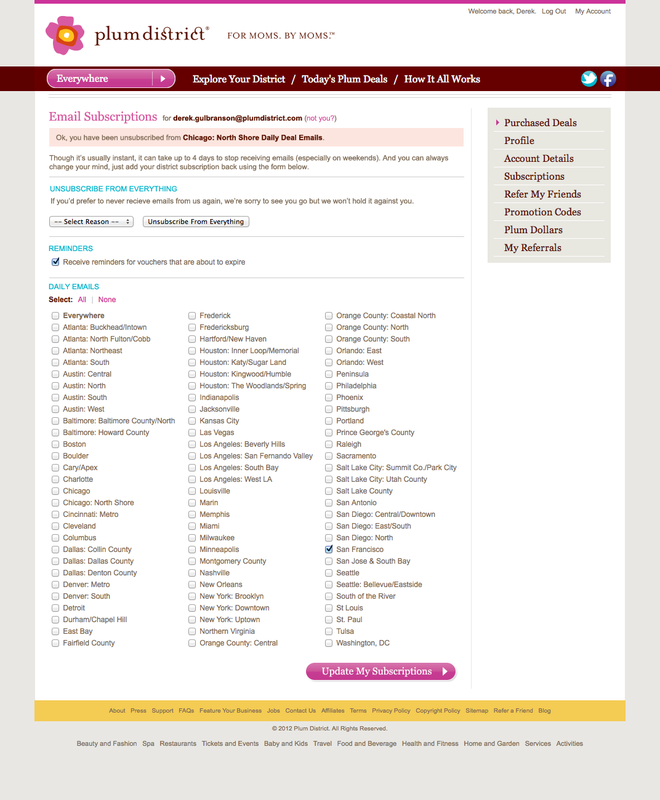 During the holiday season Sales focused their deals into several promotional categories. I worked to develop badges for each type of deal. Some examples of the design variations we looked at. Example of how the Holiday badges were incorporated into the Deal Page, as well as one of my favorite promotional header designs using Christmas ornaments. 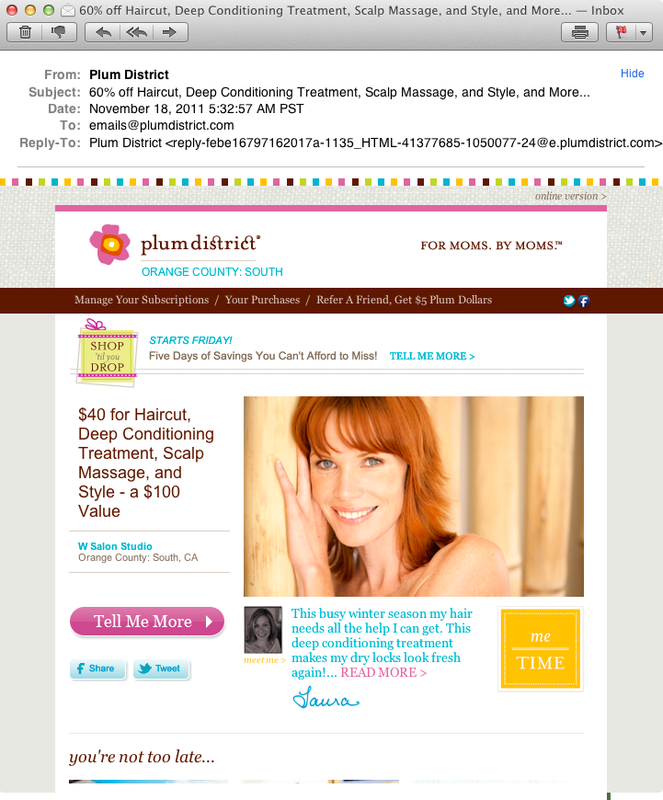 Shop Till You Drop promotional site header that aligned with the Daily Deal email below. 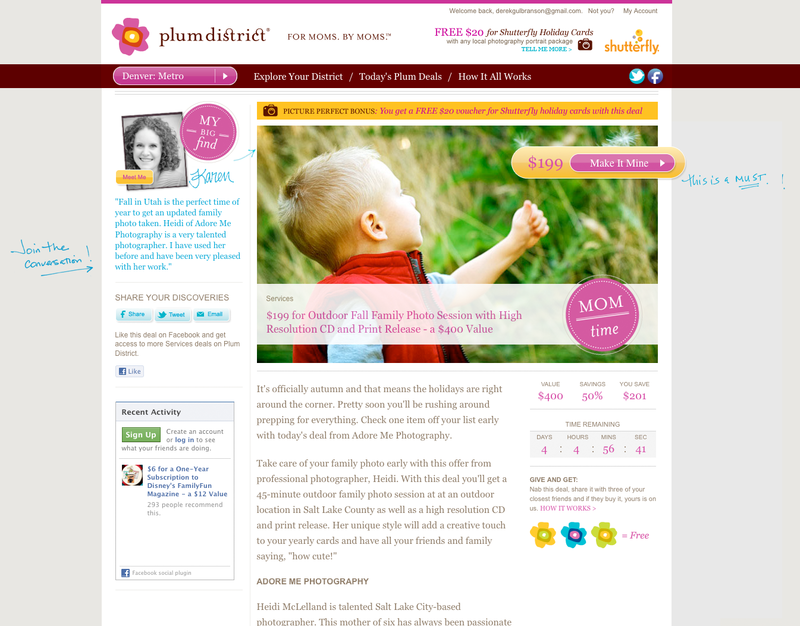 As another example of working within existing limitations, before the rebranding I incorporated a promotional header for a “Moms Rock” promotion and a photo sharing contents into the existing site design. 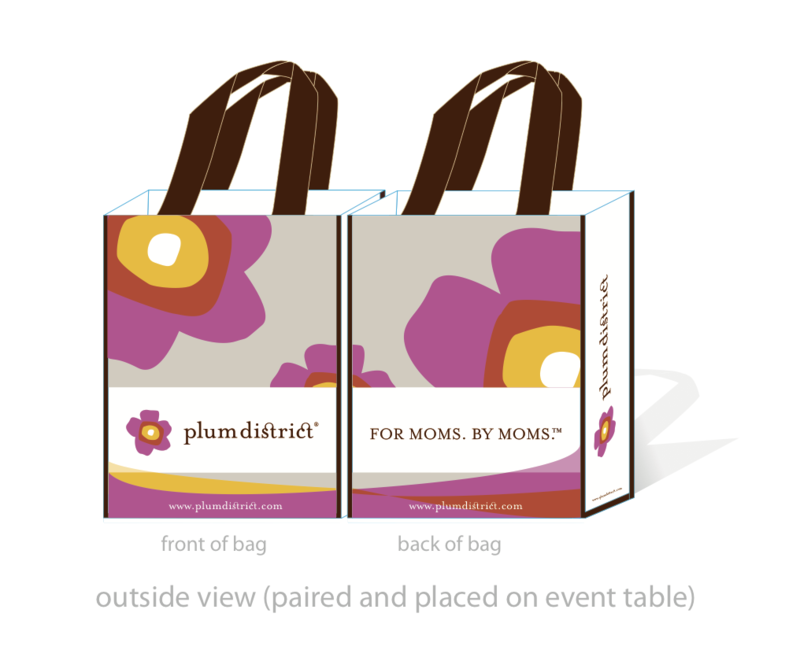 The Plum District brand had 3 audiences; those purchasing deals, the vendors providing the deals, and the sales team that crafted the agreements with each vendor. After the initial site rebranding I developed new branded materials across the remaining touchpoints. I designed this 3 foot by 7 foot panel to sit on a table and serve as a backdrop for the sales team at community events. 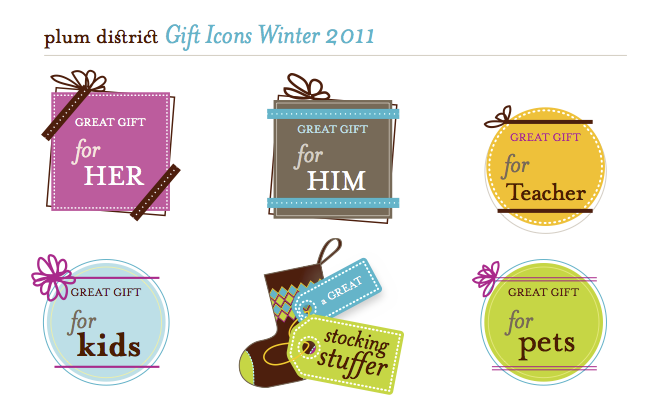 Christmas gift notes to vendors that coordinated with the holiday promotional designs for the website. 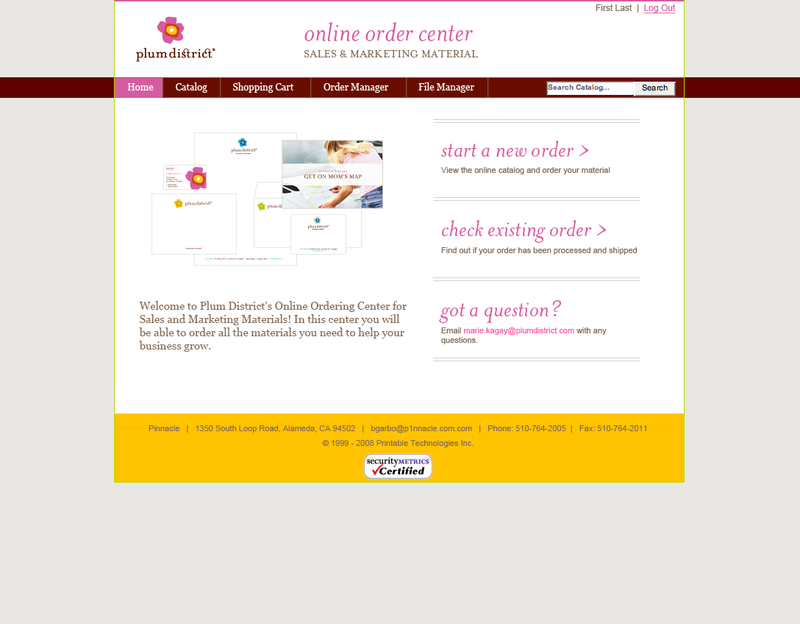 I worked with Marketing and our print vendor to create an online fulfillment center. The sales team could order their own business cards and marketing collateral directly from the print vendor’s warehouse. 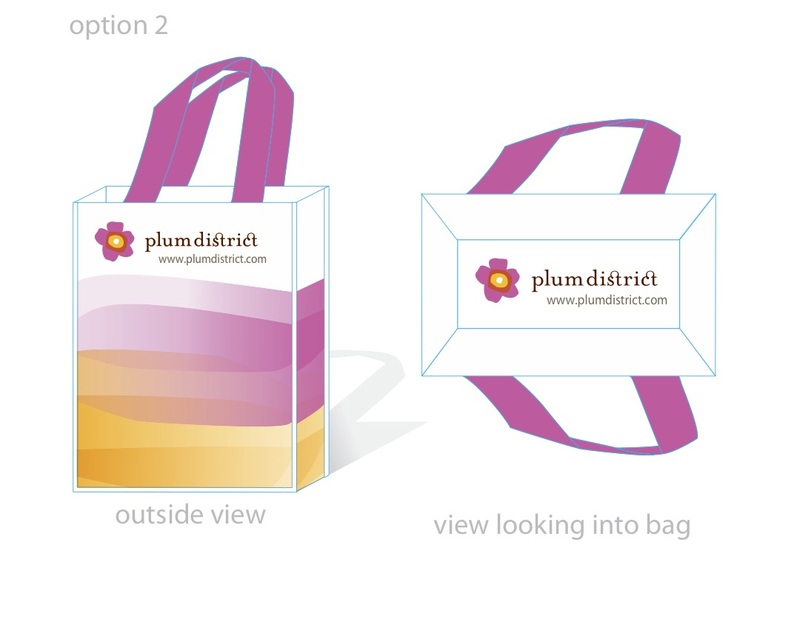 The sales team distributed these bags at events. I worked with several other designers to produce design variations, and the brought the selected design through to final production.